In 1962, fresh out of business school, Phil Knight borrowed $50 from his father and created a company with a simple mission: import high-quality, low-cost athletic shoes from Japan. Selling the shoes from the boot of his Plymouth, Knight grossed $8000 in his first year. Today, Nike's annual sales top $30 billion. In an age of start-ups, Nike is the ne plus ultra of all start-ups, and the swoosh has become one of the most ubiquitous and recognisable symbols in the world today. 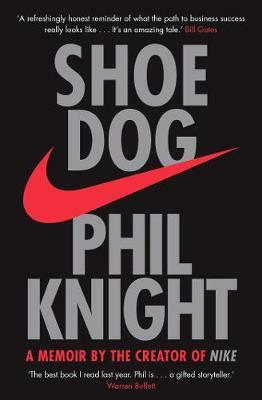 For the first time, Phil Knight spells out the complete story behind that success, peeling back the gloss of a global multinational to reveal the pitfalls and glories of founding – and building – Nike. From the almost accidental nature of the company logo to the vast complexities of a leading edge business split around the globe, Shoe Dog is very much a business bible for the 21st century. Fascinating insight though the troubles, heartache and triumphs but always upbeat and moving forward.